The late 1830s were years of great ferment, progress, growth and change for the United States Mint. Steam-powered coinage made its debut in 1836. The first branch mint opened in New Orleans in 1838, and new designs were placed on all the gold and silver coins between 1837 and 1840. The technical and artistic advancements were interrelated, for it was the introduction of steam power that stimulated Mint officials to update the coinage aesthetically as well. On the silver coins, the new look took the form of a seated figure of Liberty with her right hand resting upon a shield and her left hand grasping a pole topped by a Liberty cap, symbols of preparedness and freedom. Thirteen stars are arrayed around her, and the date is below. This design first appeared on pattern and regular-issue silver dollars in 1836, and thereafter was adapted for use on all the remaining silver coins: the half dollar, quarter dollar, dime and half dime. This "Seated Liberty" design (interchangeably known as the "Liberty Seated" type) was fashioned by noted portraitist Thomas Sully and executed by Mint engraver Christian Gobrecht, a man of great technical skill. 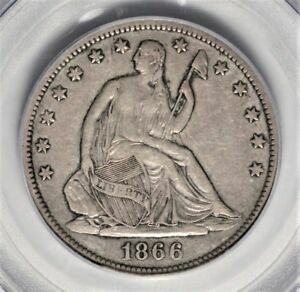 Its neoclassical appearance accurately reflected Americans' artistic taste in the mid-19th century and, indeed, nearly to the threshold of the 20th century, for that's how long it lingered on three of the coins before giving way to the Barber design in 1892. The half dollar was the last of the five coins to get this new design. Well into 1839, new 50-cent pieces continued to bear the Capped Bust likeness of Liberty long viewed with affection by collectors. Since 1836, however, Capped Bust halves had lost a key part of their earlier distinctiveness and charm because they were being made on a steam press and with reeded edges, rather than the old-style lettered edges. The so-called "Gobrecht dollars" of 1836-39 wedded the Seated Liberty obverse to a breathtaking reverse featuring a majestic flying eagle. This was the work of another exceptional artist, Titian Peale, again with the die work by Gobrecht. Unaccountably, though, this magnificent design was scrapped when the art work was adapted for the smaller silver coins. Then, in 1840, it was dropped from the dollar as well. Mint officials chose instead to use essentially the same reverse on the half dollar and quarter as the one that had appeared on their Capped Bust counterparts. Again, the central device was a naturalistic eagle with a shield superimposed upon its breast. UNITED STATES OF AMERICA is inscribed above the eagle on each of these coins, and the statement of value appears below. On the 50-cent piece, this takes the shorthand form HALF DOL. The Philadelphia Mint struck nearly 2 million Seated Liberty half dollars in 1839, the first year of issue, and these come in two major versions. Coins produced from the very first obverse die show no trace of drapery at the crook of Miss Liberty's elbow, while subsequent strikes all exhibit a fold of drapery there (unless they have undergone excessive wear). The No-Drapery pieces are scarce in every grade and flat-out rare in mint state levels of preservation. Seated Liberty halves remained in production for more than half a century, from 1839 through 1891, and mintages generally ranged between 500,000 and 2 million, with higher peaks and lower valleys. These coins saw widespread use, but people viewed them respectfully, for many Americans' weekly pay was well below $10 in those days. The series' unusual length makes it somewhat unwieldy to collect. Partly for that reason, hobbyists have divided it into several sub-categories. Perhaps the most important division is the one between "No-Motto" and "With-Motto" examples. The motto in question is IN GOD WE TRUST, which first gained a place on U.S. coinage during the Civil War. In 1866, the Mint added this inscription to the half dollar, placing it on a banner above the eagle. It remained there throughout the remaining quarter-century of the coin's production. Two other major varieties loom large in the 27-year life-span of No-Motto "Seated halves." Both were direct results of the California Gold Rush, which totally upset the delicate balance the Mint had been striving to maintain in the relative values of gold and silver in U.S. coinage. As huge amounts of gold poured out of California, the yellow metal's value dropped in relation to silver: Soon, 200 half dollars melted into bullion would buy not $100 in gold but $106.60. This, in turn, could then be exchanged at face value for more silver coins. 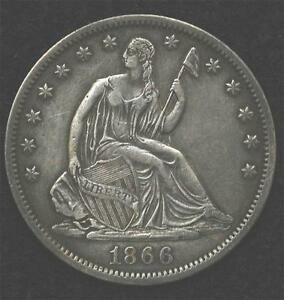 By 1853, silver coins were worth more as metal than as money, and melting was rampant. The Mint combated this imbalance in 1853 by reducing the amount of silver in its coins. With the half dollar, it trimmed the overall weight from 13.36 grams to 12.44. To call attention to this change, it placed arrows alongside the date and rays around the eagle. The arrows remained in place for three years, but the rays were removed in 1854. This created two significant varieties: the Arrows-and-Rays half dollars of 1853 and the arrows (without rays) pieces of 1854 and `55. The arrows were removed in 1856, but the lower weight continued. These varieties are popular type coins. No-Motto Seated Liberty halves were made at two branch mints, New Orleans and San Francisco. The "O" or "S" mintmark can be found below the eagle on these coins. 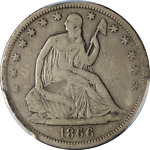 Low-mintage No-Motto issues include1842-O Small Date, 1852, 1855-S and 1866-S. 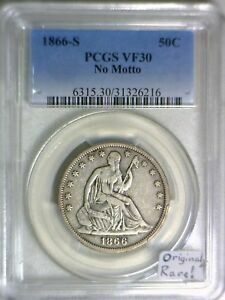 The 1866 No-Motto Philadelphia piece is believed to be unique (as is its companion quarter). Proofs were made for public sale beginning in 1858, and small numbers exist for some of the earlier dates. 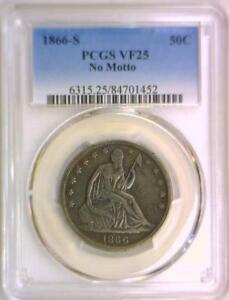 No-Motto Seated halves are relatively plentiful in grades up to Mint State-64. Above that level, however, their availability drops sharply. Points to check for wear include Liberty's knee, breast and head, and the eagle's head, neck and tops of wings. Bowers, Q. David, United States Dimes, Quarters, and Half Dollars, Bowers and Merena Galleries, Wolfeboro, NH, 1986. Wiley, Randy, & Bugert, Bill, The Complete Guide to Liberty Seated Half Dollars, DLRC Press, Virginia Beach, VA, 1993.